The Tuckasegee River delayed harvest section has been fishing great still for the month of April 2016 in Bryson City and Webster! I kept this post to have a few archived on the blog. Be sure to check on the updated info under Fishing Reports which is monthly. 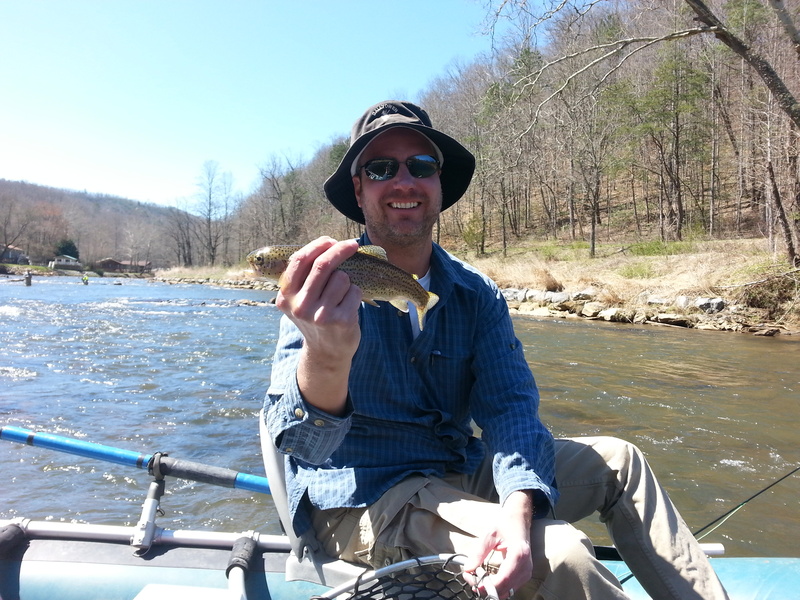 Tuckasegee fly fishing report is here to provide updates on conditions of the river for trout fishing the Delayed Harvest. The past few days have been ideal conditions with overcast skies and light rain in Webster, NC. 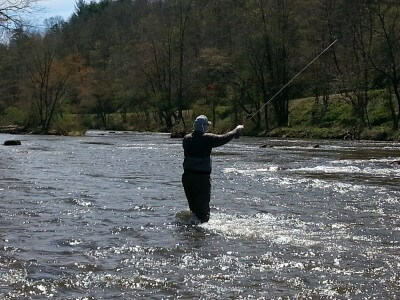 There is no better time to learn to fly fish than the month of April and May! Had a great few days floating and wade fishing with Steve and Greg from Bellefonte, PA which is the home of the PA Fly Fishing Museum and my Richardson chest pack. 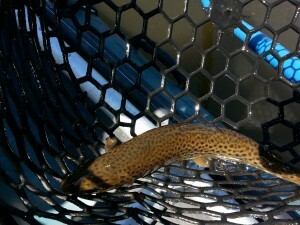 The streamer bite was great on Saturday on the lower section of the Tuckasegee. We also used many mop fly patterns for the nymph fishing. The delayed harvest section of the Tuckasegee River has been fishing well all through the spring. The amount of pressure has been great on the fishery so the tactics change from what worked best a few days ago. This time of year the trout want movement with the hatches that occur. Still seeing great BWO hatches on the overcast days. The caddis activity is still happening with the onset of the mothers day caddis hatch. Swinging wets during these active times are one of the most productive methods for numbers of fish to the net! It is also among the most underutilized methods on the stream by the masses. The Tuckasegee has been good for months now with great Black Caddis active in the morning. The mayfly hatches of BWO’s have been great on the more overcast days. The fish are still chasing streamers well like Olive Woolly Buggers, Black Ghost, and Muddler Minnows. One of the best methods for being into numbers quick is to rig up a dry dropper rig. Stay focused on the foam lines from current and mend to keep your nymph down. Using lots of #16 jig hooks with basic patterns like a Frenchie will do the trick. The new Delayed Harvest waters in Bryson City, NC has been heavily stocked with over 27,088 trout! All of these fish in 2.2 miles of river equates to just over 12,312 trout per mile. This section of water has ample wild fish in it this time of year. The section of river in Bryson City, in general, has greater water flow with all of the feeder creeks and other rivers between Dillsboro and Bryson City. It feels similar to a western river with that kind of water volume! The lower sections of the river actually have much better bug life than upstream. We are seeing loads of Cahills on the lower sections of river between 6 p.m. and dark. This makes for some very easy dry fly fishing right where the river flows into Fontana Lake. Early morning has been good nymphing with a larger nymph on the top dropper followed by a very small fly on the point. The more pressured the fish get with being caught and released the smaller bugs begin to shine. Squirmy worms, mop flies, eggs, and other patterns that we classify as junk food have their places for freshly stocked fish. On Sunday we fished above the island in Webster with the crowds. This is more technical water because it has greater pressure throughout the season of the delayed harvest which will open to general regulations beginning the first Saturday in June. The fish were looking up throughout the day due to the overcast skies and light rain falling. The dry fly and wet fly were great on Sunday with the attention focused on the surface. 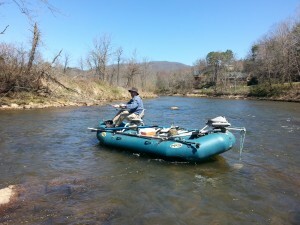 The activity has been very consistent during the entire spring on the Tuckasegee River. The best advice for those venturing out on their own to fish is to remain high in the column on the overcast days with your patterns and stay deep on the bright days. This general rule of thumb usually holds true throughout the year. The Highland Hiker shop had a Three Rivers tournament a few weeks back and we had a great time floating Geoff and Joan Cabe. The proceeds from the fishing tournament go to a fund for scholarships for the high school in Highlands, NC. Geoff landed the biggest fish of the tournament on both days on the Tuckasegee River. The Highland Hiker shop had a Three Rivers tournament a few weeks back and we had a great time floating Geoff and Joan Cabe. The proceeds from the fishing tournament go to a fund for scholarships for the high school in Highlands, NC. 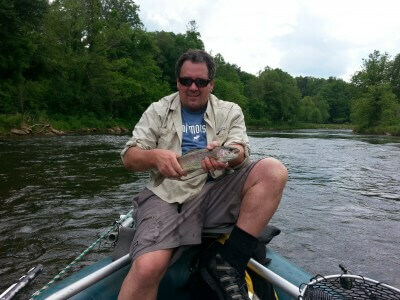 Geoff landed the biggest fish of the tournament on both days on the Tuckasegee River. The dry fly activity has been good in the afternoon hours depending on the light conditions. If it is bright out, focus on the edges that are shaded with a canopy over the water. Low light conditions enable you to get away with throwing dry flies where ever on the stream. Spend time getting your dries to float in the soft seams of the bubble lines in the current. Streamer fishing has also been very good on the higher water trips when the water is a little off colored. The brook trout react best to the streamers that include a bit of red on them like the classic Mickey Finn. The black ghost streamer has also done very well the past month. Olive wooly buggers are also a great choice for probing the waters to find pods of fish. Rainbow trout that fell victim to the wet fly! 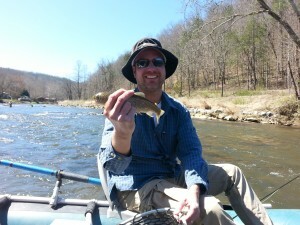 The Tuckasegee River has been great for float fishing the past few weeks in Bryson City! The hatches have been better on the lower section of the river. Often times it seems people cast to the wrong water type when you see the masses on the weekends in Webster. The water levels remain lower there typically which translates to more wade fisherman. Kind of funny that the wade fisherman goes to great pains to cast to and stand out in the middle of the river. While the anglers in boats tend to cast toward the bank. I guess it is like the saying the grass is always greener on the other side of the fence. 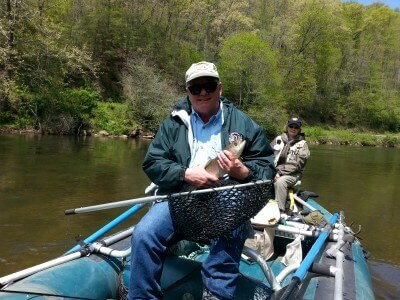 The Delayed Harvest program on the Tuckasegee has been popular with folks wanting a day of adventure fly fishing for trout while visiting Cherokee, Highlands, Bryson City, Franklin, and other nearby towns in the Great Smoky Mountains. Yesterday’s float trip was with Phil from NYC who wanted a day of R&R from the work schedule. The delayed harvest programs draw anglers from all around the country to this scenic area of the Smoky Mountains. The activity tends to be best in the fast water now at the head of pools during lower flows in the mornings. The fish pod up in large number in this type of water. 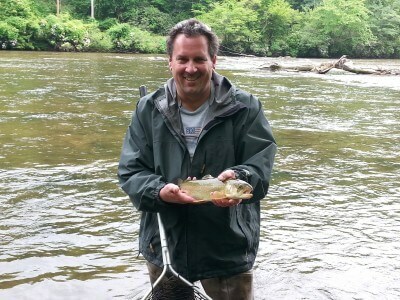 The brook trout action is in the slower pools off on the edges which are typical of all the delayed harvest streams. Yesterday’s float trip was best using nymphs fished deep early in the morning. About noon the same flies were fished much higher in the water column. We had a strong March Brown hatch come off around noon. The fished focused heavily on the surface activity looking for duns right before the increase of water flow due to generation. This was the most active period for us during the float trip. The Tuckasegee has fish pods all over the delayed harvest. There are many sections of water that we have back rowed hard to push through because the numbers have simply been poor in certain areas all year. This is typical in that the hatchery planted fish often remain in pods for a long time! The sections heavily populated are where we end up anchoring for long periods of time. Fish will move quickly into the water types that are conducive for them to survive in usually the closet proximity to where they were introduced into the stream. Final tip if you are trout fishing the Tuckasegee is that it does not take long to figure these fish out usually in regards to techniques or patterns. Rule of thumb, if what you are doing is not getting a result within a half dozen cast, then you need to change tactics! Might just mean a different tactic with the same fly you have on, might mean adjustment of tippet, might mean to change your fly! Far too often when guiding on the Tuckasegee you see people cast out bobbers when it is not working well and stay with it all day long. Offer the trout what they want and it is a cake walk to see many numbers of fish landed! The delayed harvest section of the Tuckasegee River has grown tremendously since 1994! In the early years, it was to enhance the fly fishing programs at Western Carolina for the fly fishing programs that I taught at the University. It is shocking to me how many folks know about it now! Use the contact page or call 828-736-1469 for questions or booking your next adventure to the Great Smoky Mountains! 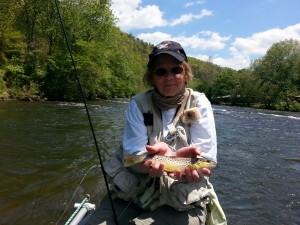 Learn to fly fish with the top outfitter in the Western NC area since 1987. We offer a host of opportunities for fly fishing but the most common include guided float trips and guided wade trips around the Bryson City, NC area. The Tuckasegee is about an hour drive from Asheville and Highlands, NC. Chattanooga and Atlanta are about a two-hour drive for the Tuckasegee. 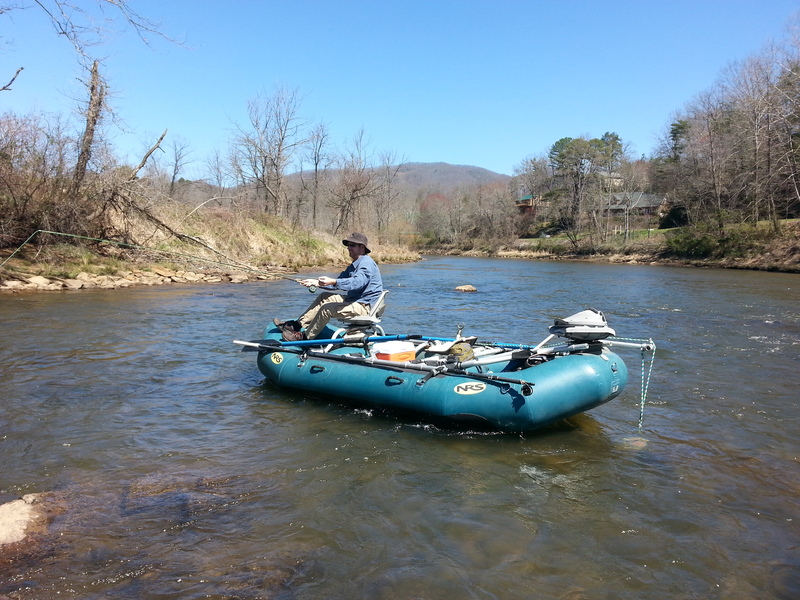 There were many groups this weekend from Raleigh and Charlotte, NC on the Tuckasegee. 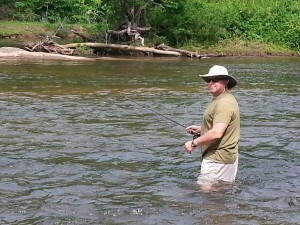 Happy fishing if you venture out to the Tuckasegee River. It has been epic trout fishing! Mac Brown is a gifted teacher and exceptionally patient with children. He knows where to find fish. He spends time teaching technique and how to crack the code. The best! The best fly fishing experience. I have been going out with Mac a number of times over a year and a half. This is simply the best fly fishing experience you will have. Great fishing but much more. Always learning with Mac, always- on casting, reading water, choosing flies, presentation, hook setting and more. One of the best days you will have on the water. Fishing with Mac Brown has been an incredible experience! I enjoy fishing with a guide who educates me throughout the day. I’ve left both times being better on the water at the end of the day. I carry a notebook with me to keep the salient points he makes. I’ve found my mentor to make a better well-rounded fly fishing angler! 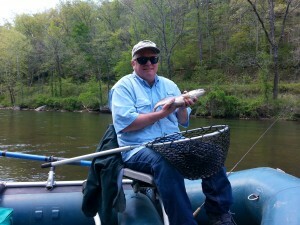 Mac Brown is the original fly fishing guide in the GSM region. I chose Mac because others had advised me of his willingness to teach beginners as well as more advanced Flyfishers. I have recommended Mac Brown to many down under in Australia. An amazing learning experience! Mac teaches you how to be a better fisherman. I learned more with one day with Mac then I have in the last five years on my own. Great guide and teacher! !